Rip 'n' tear on the go! Earlier last week, Nintendo sent a newsletter about the impending release of DOOM on its little platform that could, the Switch. 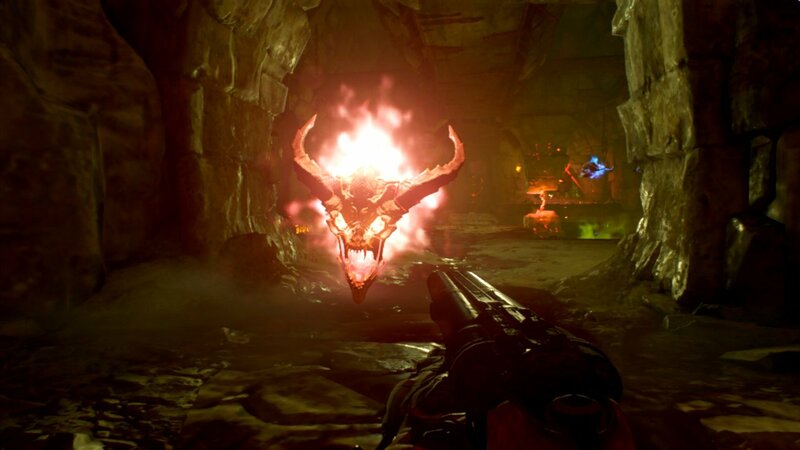 The subject line was "It runs DOOM", the stylised all-caps of the 2016 shooter of the year's title adding unintended emphasis, as if even Nintendo themselves were surprised. We're happy, and equally surprised, to report that it CAN run DOOM, but whether it should is a matter of some debate. 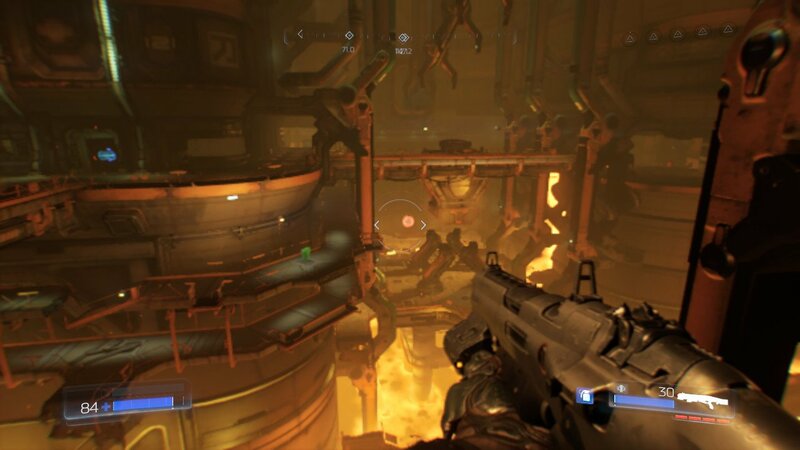 DOOM, in its PC and PS4/Xbox incarnations, is a fast-paced slick shooter with brutal gunplay and satisfying demon crunching action. It's truly remarkable how much of this has remained in its port to a machine four times smaller, portable and lacking even a tenth of the computing power of a modern desktop. Id Software, and port studio Panic Button, have surely used some sort of arcane, even satanic arts to get as much as they have into the Switch's miniature innards. The game runs at a solid 30fps and at 720p resolution when docked, which is nowhere near the most you can expect from the Switch, however it is impressive for the first of the AAA third-party ports to arrive on the platform. Nintendo has had plenty of time to eke out 900p and higher frame rates on its own hardware, but for Unreal engine games to be rendered as well as this in essentially the first few months of the console's life gives us great hope for the future. Docked and up on a big screen you're used to running DOOM on with another console or PC, the difference is clearer than night and day, but the Switch's portable tablet can make even that look stunning. As far as FPS games go for the Switch, we're still undecided on that. 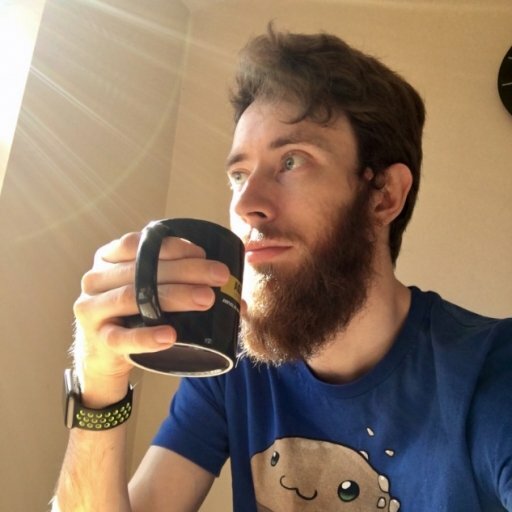 DOOM is a particular type of FPS that demands fast, bloodthirsty action – a visceral ballet of death and destruction across multiple level arenas and with some precise platforming required at times. The Joy-Con's sticks are no different from many other console analogues, but aiming and moving felt sluggish with them. There are the requisite sensitivity sliders to help you tailor to your own thumbs, but with few concessions in difficulty the action can be a little hard to keep up with. There is a aim assist option, which doesn't feel overly snappy (possibly to its detriment) and limited motion controls mean you can really get into melee attacks by raging out with a detached Joy-Con. On the go, it's a transformative experience even with some awkwardness in aiming. Plopping down on a doctor's waiting room couch and cutting through a few battles is more than worth the price of admission. It's still novel, despite handheld consoles being around for decades now, cementing that the Switch really has captured something special here. DOOM's frenetic action is well-suited to quick bursts, so pausing to get off the train or bus and picking up later is as familiar and natural as the game's time-tested double-barreled shotgun. If you've never picked up DOOM for any other platform, the Switch version isn't quite the default, unlike many other games we can think of. The framerate and textures aren't nails in a coffin at all, but experiencing the game for the first time should really be without any hindrances that the Switch's limits may impose. But if you've already ventured to hell and back and didn't get enough, this is a brilliant sidepiece. The Switch's party trick of playing anything anywhere really doesn't get any better than DOOM. But the real question is can it run Crysis?